Huawei and Leica put a lot of effort into building a unique camera. On paper, the Huawei P20 Pro camera should be the best on the market, though that paper may be tough to understand. So, let us quickly guide you through the three cameras of the Pro. The 40 MP camera is the major selling point. It features a huge 1/1.7” sensor, considerably larger than any current phone. You’re probably thinking that this means small pixels and it does, but it’s not quite so simple. The sensor features something called a Quad Bayer filter, but we should probably explain what a Bayer filter is in the first place. Camera sensors have “pixels”, but they are different from the pixels on a screen – they do not have RGB subpixels or subpixels of any kind. Instead, there is a single color filter in front of each pixel, most often Red, Green or Blue. Each pixel gets information about only one of the three primary colors. The typical Bayer filter is a mosaic-like arrangement that has twice as many Green pixels as Red or Blue (the human eye is most sensitive to green). This means that a 12 MP camera has 6 million green pixels and 3 million each of red and blue. So, how come the final photo has 12 million RGB pixels? Well, each pixels borrows information about the other two primary colors from its neighbors with a bit of math. It’s good enough in most cases, though the interpolation causes some artifacts. Each pixel still has neighbors of the other two primary colors, but they are not as closely packed as in regular Bayer and the math gets trickier. The overall result isn’t as accurate meaning you get less detail compared to a 40 MP sensor with a regular Bayer filter. But there’s an upside to the Quad variant. Huawei didn't officially confirm this, but here's how we think the HDR feature works. The image sensor on the P20 Pro are like two sensors interleaved together. This allows both “sensors” to take a photo of the same subject but at different exposures, which can then be stacked into an HDR photo. Other phones have to resort to taking two photos in sequence, but that is slower and moving subjects will shift between takes and get blurred. The timing works out like this: exposure #1 + some processing time + exposure #2. Since the Huawei/Leica camera on the P20 Pro takes both photos simultaneously, it only needs as long as the longer of the two exposures. Long story short, you’re better off keeping the camera on the 10 MP setting. You get to enjoy the benefits of HDR and the 40 MP mode isn’t as sharp as the number suggests. You may be thinking that higher resolution is still useful as it lets you zoom in on an image after it has been taken. That’s true, but if getting closer to your subject is what you want, there’s a better way – optical zoom. The Huawei P20 Pro has an 8 MP tele camera. Its lens has an 80 mm (equiv.) focal length, compared to 27 mm of the other two cameras – that’s 3x optical zoom. Since the tele camera is next to the 40 MP camera, their views of the world overlap, allowing the chipset to combine information from both cameras to achieve 5x hybrid zoom. The quality isn’t as good as the optical zoom, but it’s miles ahead of other phones, which typically have 2x tele lenses without the benefit of a high-res neighbor. What about the third camera, the 20 MP black & white one? Well, that one does not have a Bayer filter at all – no need to record color – so it gets more light. You see, the filter removes much of the light so less of it reaches the pixels. A B&W camera handles better in the dark, but most people want color images. There’s a workaround to that. Recall that both the 40 MP camera and the B&W one have the same focal length, 27mm (equiv.). This means they see roughly the same image – not just overlapping images like the tele/40 MP cameras, but actually the same image from left to right, top to bottom (aside from a small shift in perspective). This allows the P20 Pro to combine the low-light shooting advantages of the B&W camera with color information from the 40 MP sensor into one bright and colorful nighttime shot. We suspect that Huawei uses the B&W camera even during the day, the phone will complain if it’s covered up (even in broad daylight). Plus, the P20 Pro is the only phone currently on the market that can push the ISO up to 102,400. Sony recently teased a prototype that can do that, but it was just that - a tease. Current Xperias top out at 12,800. Of course, higher ISO means higher noise. For nighttime landscape photography, you want to increase the exposure time instead. Lucky for you that Huawei's AI-powered stabilization allows you to shoot multi-second exposures hand-held. The results are beyond impressive. Naturally, both the 40 MP camera and the tele camera have optical image stabilization. That's quite important with zoom as every twitch of your hand is multiplied by the zoom factor. 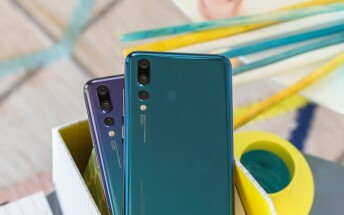 Huawei and Leica also improved the Laser autofocus system, which now works up to 2.4m (twice as far as P10's Laser AF) and there's "4D autofocus" with motion prediction to make sure subjects stay in focus. If you had any doubts that Huawei and Leica built one of the most advanced mobile cameras on the market, just remember this – in the majority of its shots it’s using two of its three sensors and melds their images seamlessly.